The idea of the “man cave” is not a new development, as men in the 50s and 60s had their office or den where they would retreat to read, write, or watch TV. 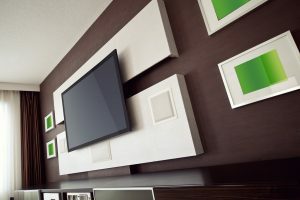 With the rise of technology, especially advanced television and gaming equipment, the man cave has become more widespread among modern homeowners. At Better Built Barns, we love helping people find the perfect custom shed for their property, and one of our buildings could be ideal for your new “guy” spot. If you want to get started building, contact us today! Lots of guys enjoying watching the game on Saturday or Sunday, and many have invested in the latest gaming technology so that they can compete (and sometimes cooperate) with their friends online. One of our custom sheds or garages could work perfectly as your new home theater area, and when you’re not watching football with your buddies or trying to conquer that next level, you and the family can sit down to watch your favorite movies. There will be room for a couch, the screen, the vintage popcorn machine, and much more! Maybe the thought of a game room is more enticing to you, where you can set up a pool table, Foosball table, or bring in a refurbished arcade game cabinet. The possibilities are endless, and if you’re looking for somewhere where you can retreat after a long day, a shed in the backyard could be the best option. For some men, the man cave is a place where they work on their motorcycle, ATV, or other mechanical project. A dedicated workspace in another structure helps keep the garage clear so that they and their spouse or partner can park the cars inside, instead of leaving one out in the driveway. You might be thinking about mounting a flat screen TV and adding a workbench so you can watch your favorite shows while you work on your latest project. If you’re interested in building a man cave, contact us today. We’re proud to serve Oregon, Washington, and Colorado, and we look forward to helping you!